He and others have also identified a host of things that can drain our willpower, including hunger and fatigue, while neuroscientists are struggling to understand exactly how the brain’s higher reasoning center - the prefrontal cortex - manages conflicting wants and needs to help us make the right decisions. The reason for all this interest? Willpower, it turns out, is one of the most important predictors of success in life. While small studies through the years have linked high levels of self-control to better health, relationships, and finances, a landmark study published this past January provided the strongest evidence to date. In the study, Duke University researchers culled data from a group of more than 1,000 New Zealand young adults followed for three decades and found that those who scored high on tests for self-control when they were 3 years old were far more likely to be healthy and financially successful as adults than those who did poorly on the self-control tests in preschool. 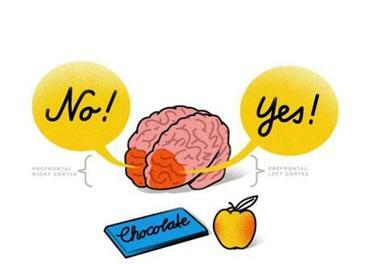 Facing a decision over whether to eat a nutritious apple or decadent chocolate bar activates the brain’s prefrontal cortex. The right side propels you to say no to the chocolate temptation while the left side encourages you to say yes to the apple to curb your hunger. The researchers took into account differences in childhood socioeconomic class and IQ scores, and determined that 11 percent of those with the highest levels of self-control as children had multiple health problems as adults, such as obesity, gum disease, and sexually transmitted diseases, compared with 27 percent of those with the lowest levels of self-control. Thirteen percent of those with high self-control had been convicted of crimes compared with 43 percent of those with the lowest levels, and just 10 percent in the high self-control group earned less than $17,000 a year compared with 32 percent in the lowest group. The researchers also found that self-control variations among siblings pointed to their success decades later. “Differences between children in self-control predicted their adult outcomes approximately as well as low intelligence and low social class origins,’’ wrote the study authors. Those striving to complete a marathon, a diet, or a doctoral dissertation can gain the willpower to help reach their goals by doing little self-control tasks throughout the day, like fixing their posture, avoiding curse words, or controlling their temper at home, according to Baumeister. And those who engage regularly in high-willpower activities like exercise, meditation, or learning a new language or craft tend to exhibit higher levels of self-control in other areas of their lives. 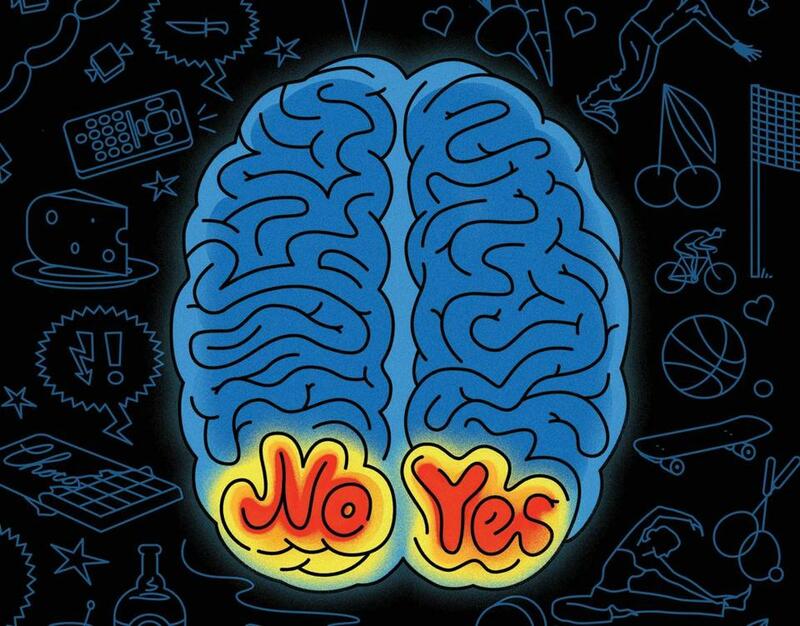 Neuroscientists believe these acts reinforce neural pathways in the brain’s prefrontal cortex that help us say “yes’’ to our goals and “no’’ to procrastination and temptation. The brain’s ventromedial prefrontal cortex helps with goal planning and the making of longterm decisions. It holds memories of what type of person you believe yourself to be and helps you act like that person. Exerting willpower, however, requires the brain to use a lot of energy in the form of glucose, which it may not have if you are hungry or not able to metabolize glucose as efficiently due to lack of sleep or stress. “All of these things cause mild dysfunction in the prefrontal cortex,’’ said Stanford University psychologist Kelly McGonigal, author of the forthcoming book “The Willpower Instinct.’’ “It’s as if you have brain damage in areas you need to have self-control. And that turns you into the worst version of yourself’’ - the one who snaps at the kids, misses the work deadline, and attacks the ice cream in the freezer. Recent brain imaging studies indicate that different regions of the prefrontal cortex are responsible for different elements of willpower. The left side revs you up and gets you moving through your to-do list, while the right side helps you avoid temptations that derail your diet, work, or exercise regimen. 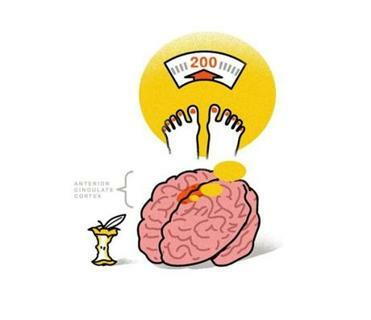 A smaller brain region in the middle - called the ventromedial prefrontal cortex - helps you weigh the myriad decisions coursing through your mind minute to minute. Should you check your Facebook feed or write that memo? Will you have a chocolate chip cookie or an apple? How will you respond to your child’s whining? The anterior cingulate cortex regulates conflict that arises as soon as you want that piece of chocolate. It notices craving and sends signals predicting what will happen if you do eat the chocolate and what will happen if you don’t. 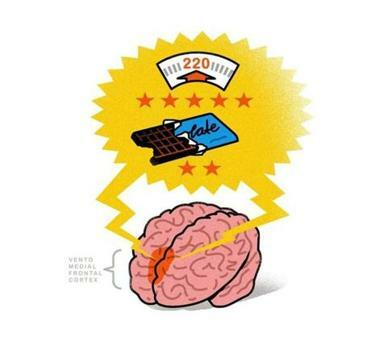 Those with high levels of self-control often make better decisions because they consider long-term goals rather than just the instant gratification, due possibly to better coordination among all of their brain regions involved in willpower. When California Institute of Technology researchers performed functional MRI scans on 37 dieters for a 2009 study published in the journal Science, they found that dieters with high levels of self-control considered both health and taste when making food choices and that both their ventromedial prefrontal cortex and their left prefrontal cortex were highly active when making these choices. Dieters with low self-control considered only taste when making food choices and had high activity in their ventromedial prefrontal cortex, with much lower activity in the other brain region. “We’re still trying to figure out the basic mechanisms by which the prefrontal cortex controls willpower,’’ said Earl Miller, a professor of neuroscience at the Massachusetts Institute of Technology who studies the neural circuitry of self-control. “We know that those who have damage to their prefrontal cortex due to a stroke or other brain injury often behave in a reflexive, mindless way’’ without any thought of consequences. But, he adds, researchers still haven’t figured out exactly how the brain learns appropriate behavior like muting a cellphone during a concert or whispering in a library. What is clear is that just like a muscle, willpower can get depleted when it’s overused. In a 2009 study involving 84 college students, Baumeister found that those assigned to write an essay without using words containing common letters - which required a lot of willpower - were more likely to dishonestly report their scores on a subsequent math test to earn a small monetary reward than those who were instructed to write an essay without the same restrictions. Yes, being honest and avoiding the temptation to cheat both require self-control. While we all give in to sinful urges on occasion, berating or shaming ourselves into getting back on course may actually be counterproductive, said McGonigal, leading to more slip-ups down the road. One study found that those who forgave themselves for failing at a task were more likely to brush themselves off and try again, while other researchers demonstrated that dieters given a pep talk after eating a doughnut - emphasizing that one small setback wouldn’t ruin all their hard efforts - were less likely to indulge later on than doughnut eaters who didn’t have the talk.